I’m about to begin a Mystery Shawl, courtesy of Tracey. She’s been whetting our appetite over on the CLF board at Ravelry, and has just put up the first fourteen rows. What with the moving malarkey, the yarn I’m intending to use is here, but my hooks are over at the flat, and it’s Friday afternoon. I do need to go over there, as some of the veg I want to cook for Shabbos is there, so I’ve written the first four rows of the pattern out on paper. I’ll take over the yarn, and whatever else I can manage (it’s on cones, so bulky), do those rows quickly, if I can, and then bring back the veg and get ready for Shabbos! Each of the books in this series follows a standard format of chapters and pages, but the varying animals and authors come through vividly. I was intrigued that the chipmunk book suggested using some food and accessories intended for chinchillas, whereas the chinchilla book made the animals sound quite different from chipmunks! This book mentions Rosa Parks once, whereas the Parks one mentioned King a few times. (The books are from different series, authors and publishers.) I suppose King comes across as a more general leader. He’s an interesting figure, and this book is a good read even for adults, although it’s written to be a fairly easy read. I would recommend it to older children and adults for whom reading is newer than it might be. I packed a couple of boxes last night, then lay down briefly before blogging… Apart from a couple of interruptions from people who (reasonably enough) assumed that my light being on at 10:30pm meant I was awake, I basically slept through until 3.30am. So anyway, it’s 7am, and I’ll just mention a couple of craft books I read yesterday. The kitsch is played up, with lots of background imagery from adverts of the 1950s and beyond, but several interesting crafts are described, and some have instructions and/or patterns included. I surmise one or both of the authors is a crocheter, as there are pages and pages of crochet patterns, where most of the crafts only get one or two. There are some great ideas here, and some amazing footwear, but I’m afraid I’m a bit too conservative with my footwear to try any but the very subtlest of embellishments. Full patterns are given for making baby shoes from scratch, as well as for decorating bought shoes for all ages, and anyone could have fun with shoes for the very young. I took my Gardening Bag and its strap-in-progress and spool to the knitting etc group tonight, which was fun. I overlapped briefly (I was late) with someone crocheting granny squares, and the others were knitting socks, so we were all working around and around, and mostly on tubes! I went straight to a great shiur afterwards, and did a few more rows before it began, and then later on during it, when my general level of fatigue was inclining me to drop off unless I had some kind of physical movement going on. I made sure to be mostly looking up at the lecturer, and obviously paying attention as I worked my spool! Now I just have to work on not being angry and frustrated (mostly with myself), as that’s what the shiur was on. This is one of those Atwood books I really enjoyed, for its comedy, cynicism, cultural and literary references, and general silliness, pointedly based on the silliness in the Odyssey and Iliad. Penelope is a great narrator, knowing about the events of her era but completely oblivious to the real feelings of those beneath her. It’s not that she doesn’t care about her maids, say, but she just doesn’t believe their emotions outweigh her needs. And this book gives some background as to how a Penelope might come to devalue the sentiments of a maid or other slave, no matter their normal interactions. It does focus later on 18th and 19th century slavery in America, but has brief chapters earlier on about how widespread the variants of the practice were, throughout time and place. While not an original, authentic, scrapbook of a young and adolescent boy in WWI London, it certainly seems like it could have been. There is a lot of information about the time and attitudes of that time in a believable story. The illustrations are very good. Although this book is written from an American perspective, for American and international readers, that did not grate, nor was it even so noticeable more than a couple of times. Otherwise this has good pictures among clear text. I saw Vermeer‘s Guitar Player on Friday at Kenwood House, and I think I should go back and examine it again in peace. I have reviewed other artist biographies in this series before, but I especially like this one, despite some of the interpretations, perhaps because it includes all the paintings reliably suggested to be by Vermeer, and discusses each one as part of a flow of his oeuvre. This is very clear and interesting, both in the graphic storyline and in the text introduction and appendix. I’ll look for more of the series. It is slightly hagiographic, but it is very good. I really like this story of M. (soon to become Taylor) Greer, who has spent her adolescence and younger adulthood preparing to leave her small town, saving money and most importantly refraining from getting pregnant. Within a couple of days of getting out she has been given a baby and in this book slowly makes them a new family circle. One thing I’m never sure of in this book is how old Taylor really is. She’s probably in her mid-twenties, but she never quite says. The book seems very simple but there’s a lot in there, and I’m glad I reread it. I read this first a couple of years ago, and simply enjoyed and thought about it on its own merits, which are manifold. Then a few months later I found Pigs in Heaven, which is a sequel that takes apart the mechanism by which Taylor gets to keep Turtle (the baby), and which is also very good, but which for me gives this book a fairy tale gloss, as I know the happy ending can’t last and was over simplistic. I’ll probably reread that next, so will talk more about the pairing then. The strap for the Gardening Bag is coming along slowly but surely, but even though I wasn’t at work today I got hardly any more done. Instead we went shopping for the flat (and now have to stop doing that for a bit, as it’s expensive!). We went to a couple of smaller places first, and then to IKEA, which I’d never been to any branch of before. It literally took us three hours to get around that massive place, and I feel bad when I wonder just how they get many of the prices so low, but that’s what we did today. 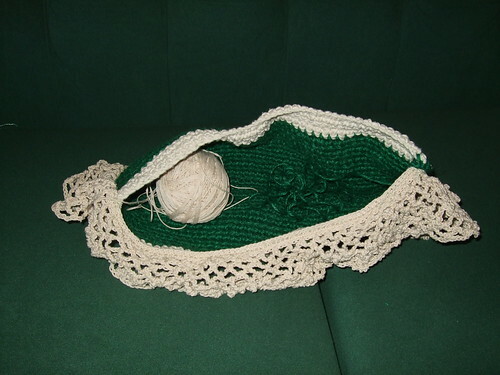 There were a few crocheted items (storage bags and the like), which were at least sign-posted as hand made, so not quite as cheap as some of the more mass-produced items, but the craftsperson was certainly not well paid for the work. The ones I saw were all made of very rough fibres (jute and worse), so not easy on the hands, either. I have no reason to doubt their ethical policies, but I have to use my own intelligence when I see an item I do know a little about. I do normally try to buy as ethically as I can, but it’s also not ethical to make someone else spend more than they can afford, is it? I had never come across this before being recommended to it on Ravelry, months and months ago, apart from seeing posters for the film of a few years ago. I haven’t seen the film itself, however. Brenda Dayne‘s reading was itself deservedly highly recommended to me, and I would second that. The rarefied, stultified, atmosphere of upper class New York society is all Newland Archer seems to expect or want, until his fiancee May’s accepted-but-verging-on-scandalous cousin, the Countess Olenska (looked down upon nearly as much for having married a European – and a nobleman, at that! – as for having left said husband) reappears in New York, inciting all of Archer’s restlessness and dissatisfaction with the society he has grown up in and the part he is expected to play in it, and becoming his obsession. I was never convinced the Countess was as smitten with Newland as he was with her, but perhaps she just cared far more for all of the people they were all connected with than he did, if caring far less for their conventions. The Railway Children live in a very different kind of innocence, where they do their best to help all those around them, and believe the best of them, while being protected from those who might try to look down upon them. The legal system might believe the worst of their very honourable father, but somehow, no-one ever seems able to do so of them. And, of course, their intentions always are good, no matter the scrapes they get into. We’re still moving, rather than fully moved, although hopefully that will progress a lot further over the bank holiday weekend. This theme, of making one’s home under often difficult circumstances (far harder than any we are personally facing, thankfully) and trying to be understood and to understand within specific cultures runs through the three books I finished today and yesterday. Xinran‘s recounting of the lives of a very wide variety of Chinese women is eye-opening and in many cases shocking. Somehow this is not an entirely negative tale, even though most of the women have been deceived, abused, abandoned or simply ignored and devalued by an often brutal regime that mistreated both them and the men who should have supported them. There is a resilience that wins through even the misery in many cases, and even when it can’t, there is a sense that something is being learnt by others, very very slowly. This was written after Xinran came to live in London, in part to teach us in the West more about China. One of those classic (if only from the 1960s) children’s books I somehow missed out on. In 1908 twelve year old orphaned Christina goes to live at Flambards, the country estate where the horses get the best that is available, but people can make do, to live with her hunting-obsessed Uncle Russell and his two sons, Mark, who wants nothing more than to live as his father has done, and the younger William, who wants to taste the freedom of the new technologies, particularly aeroplanes. The coming of the First World War overshadows the household as Christina tries to pick her way through the best of both worlds. This is the first of a series. Well crafted chapters mix anecdote and Jewish philosophy to show how the author tries to learn from her experiences and suggest how others might do similarly. Three more books for you today, which should have come in somewhere during the last crochet/moving posts. I’ve found a tube from which to make a spool for the strap(s) of my gardening bag, but haven’t had a chance to actually make it yet. Beautifully illustrated (by Strawberrie Donnelly – isn’t that a great name? ), this is about one of those small difficult episodes in the life of a shy child that adults or the supremely confident could also do with reading for added sensitivity. Anna’s class teacher gives them all a week to produce a five minute performance of their choice, and terrifies poor Anna, who is one of those children who quietly rubs along at the back of the class, never showing the talents she displays so abundantly at home. Her little brother Simon wants her to give a puppet show, just as she does for him every night before he goes to bed, but she isn’t confident enough to do it, so she considers a few other options along the way. She gets her grandmother to teach her to knit as something she might show her class, and that becomes significant later on. A fun book for progressing readers and their families and friends. Lots of information about how to assess the capacity of one’s family to look after a dog, and then if they can, choosing and looking after the pet, training and generally committing to it. I do like this series. Sojourner Truth is one of those heroes of the Abolitionist movement in America 150 years ago whose name I have known forever. Still, that sentence about wrapped up my knowledge before yesterday. This is a short biography of a woman I think I’d like to learn more about. I hadn’t even realised she chose the name Sojourner Truth for herself when she began working for freedom for all. 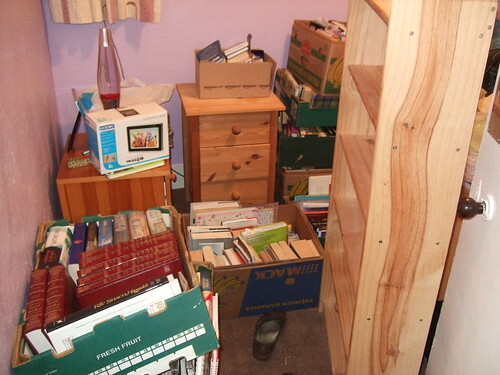 We didn’t just move the books, and bookcases, however. We also brought up a massive (and I mean massively heavy – it has a solid metal mechanism) sofa bed. Or rather, we (my flatmate and I) helped the delivery guy get it half way up the stairs, and then we all got stuck, with us above the sofa, it completely blocking the stairs, and the delivery guy at the bottom. We have wonderful friends and relations. Always always always check on the size and weight of something that needs to go upstairs, even if it’s free! 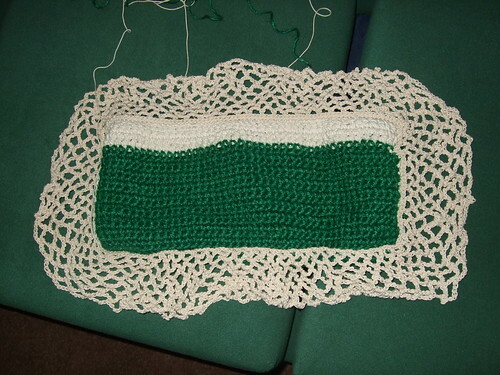 Who says a gardening bag (which might get a waist strap, so it gets worn as an apron) that should be strong enough (the green is jute) to double as a kneeler, can’t have frills and furbelows? I think it’s fun, anyhow. My computer is getting less and less happy, but I’ll keep plugging away with it. I also made a Spiral Scrubbie last night, and was working on a second on the bus this morning. Pictures to follow.